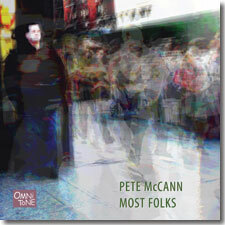 From gentle nylon acoustic guitar sounds to sinewy and intricate jazz guitar runs to roots-of-grunge Jimi Hendrix-inspired hooting, guitarist/composer Pete McCann blends straight-ahead jazz, post-bop, creative improvised music, and Latin in his new OmniTone album Most Folks that should appeal to, well, the title says it all. Featuring a quartet that includes top improvisers from the Big Apple’s vital jazz and creative music scene, Most Folks should turn lovers of good music on to one of jazz’s best-kept secrets. The eminently listenable CD features homespun and wide-ranging inspirations from McCann’s life including his kids and Ecuadorian aunts to Middle Eastern cab drivers, Colonel Sanders, and a “backspeaking” commander-in-chief to guitar heroes Allan Holdsworth and John McLaughlin. Buy Most Folks now at the OmniTone store.